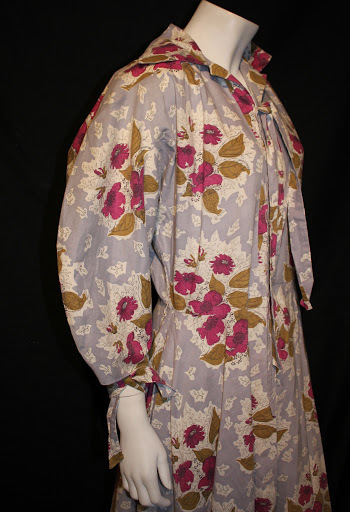 A few months back now I purchased an absolutely beautiful Horrockses housecoat from Vintage Vision, the company, based in Abergavenny is a great initiative. 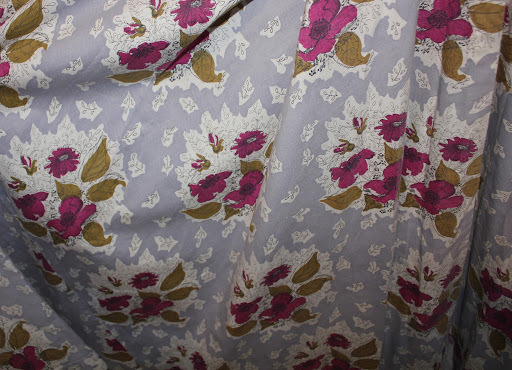 So, onto the houescoat itself, this is the stunning piece I purchased, in typical high quality Horrockses cotton. I’m pretty sure it is an Alastair Morton print- it has the “handwriting” of his design style written all over it! 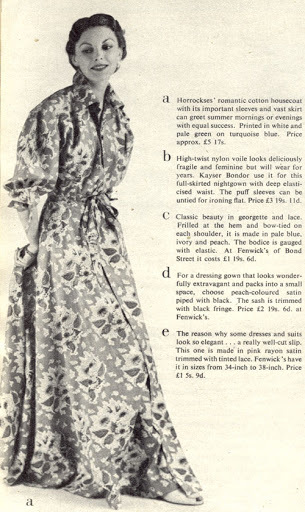 Whilst looking through archive posts on one of my FAVOURITE blogs (http://sheepandchick.blogspot.co.uk/ ) I found an advertisement for my housecoat!!! The advertisement even has the original price for the housecoat £5 17s, a considerable sum equivalent to just over £135 today! 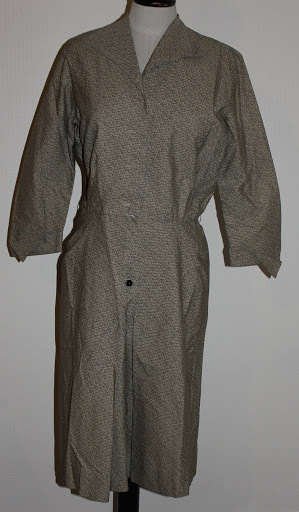 F.Y.I a housecoat was a type of dress for lounging in and accepting visitors, it wasn’t a dressing gown as they are sometimes misconstrued as being! 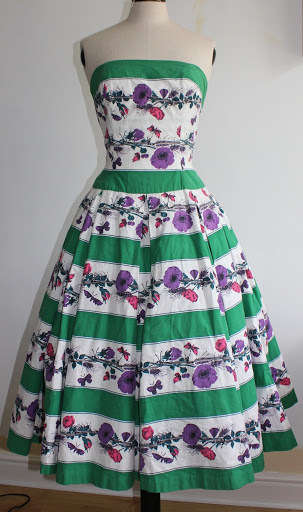 A few weeks ago I received a rather exciting email regarding Horrockses, and I suppose this blog posts as both a plea for anyone who owns/ has owned certain dresses and also providing some more information on the brand. 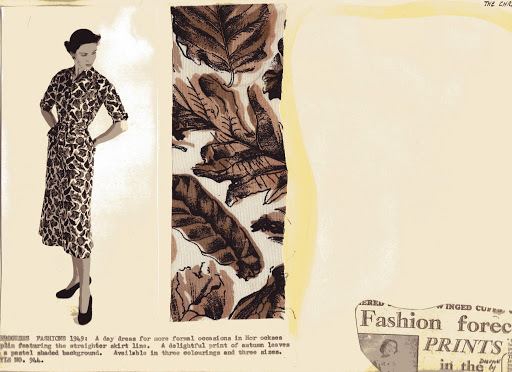 Horrockses during the 40s and 50s employed a large number of different designers to create their printed textiles, some such as Eduardo Paolozzi created only a few desings, whilst others, such as Pat Albeck and Graham Sutherland created huge numbers of designs for the company. Some designers, Albeck is a great example, have a very distinctive illustrative style which can be quickly recognised. Although others output and style was more varied. 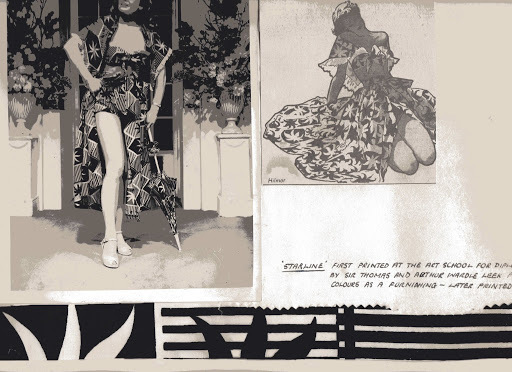 I know that some of the print designers worked on commissions for the fashion designers at the company (a lobster print created for John Tullis by Pat Albeck is a particular favourite of mine). Although I have come across a large number of print designers for Horrockses a chance search on twitter a few weeks ago turned up researchers gold. 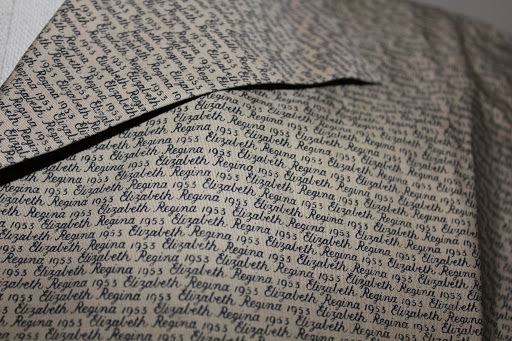 One of the most special Horrockses I have is one printed with “Elizabeth Regina 1953”. Tht tweet related to this very print. 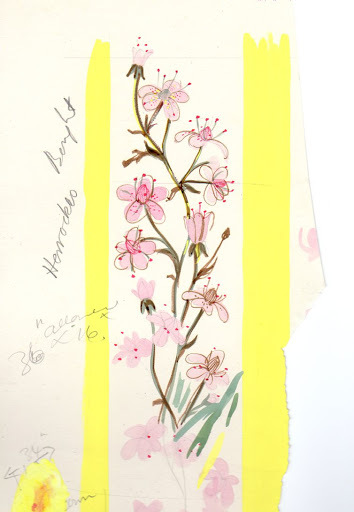 The print was designed by Margaret Meades who worked freelance for Horrockses. 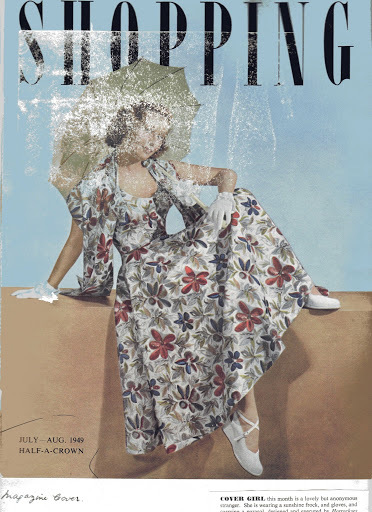 Her designs weere mostly used in the early years of Horrockses fashions (late forties early fifties). Margaret trained at Manchester College of Art where on graduating she continued to lecture for many years. 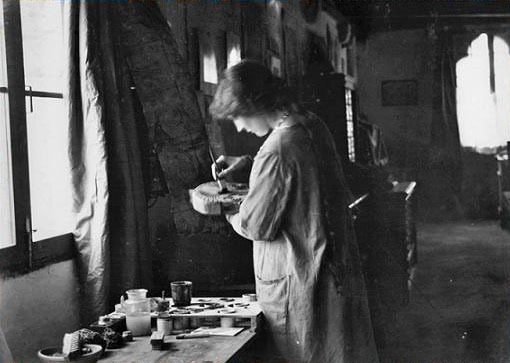 Margaret was also a member of the Society of Industrial Artists. Here are a few more of Margaret’s designs which were kindly sent to me by her daughter. It would be great if anyone has the original dresses, so that they can be compared to her designs. The print above has to be my favourite by Meades, and is also very familiar, I feel sure I have seen this one before! Also! 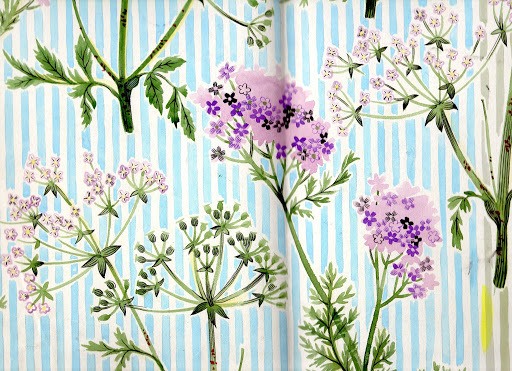 If you have orignal dresses that feature any of the prints i have shown please do send me pics. 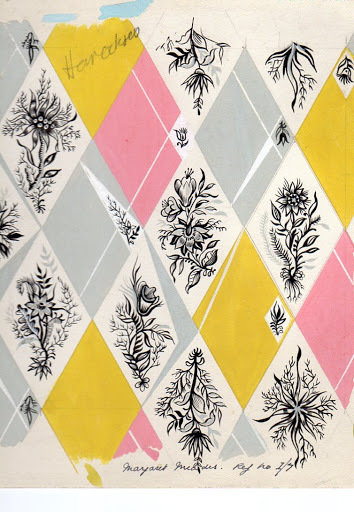 A quick note: All of these designs were sold to Horrockses, but they were not necessarily produced. 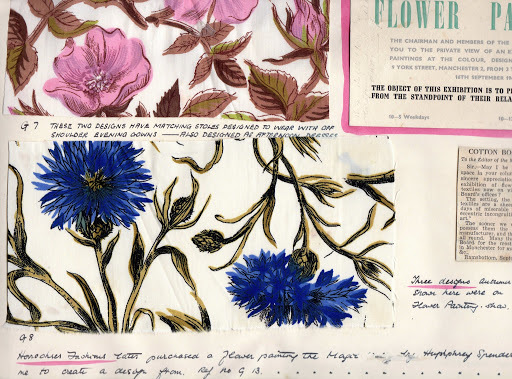 As I explained in my post for Unmaking things Horrockses always overpurchased on textile designs to retain their design prestige. This morning whilst still feeling a little fuzzy headed (or rather fuzzy eyed as my eyes decided to have a hangover this morning) I was reminded of one of my all time favourite designers- Mariano Fortuny. 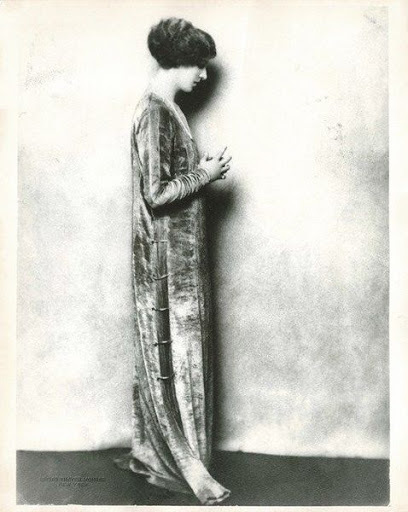 Fortuny was one of the true fashion *geniuses* of the 20th century. Not only a talented designer he was a fantastic painter ( unsurprising as both his father and maternal grandfather were painters), sculptor and inventor, a man fascinated with technology. 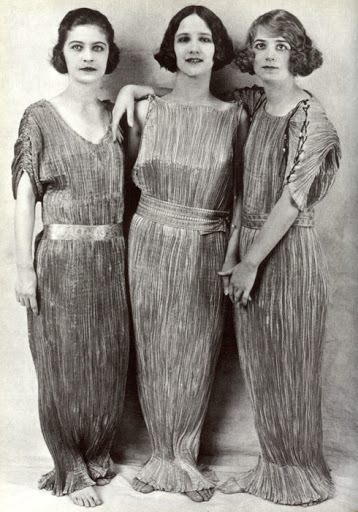 Between 1901 and 1933 Fortuny took out 22 patents, including one for his inventive pleating technique that he was so well known for in 1909. Fortuny’s most celebrated design is probably the Delphos which first appeared around 1907, like many of his pieces this was inspired by Greek drapery. It was originally designed as a “house” dress as it was worn without a corset. 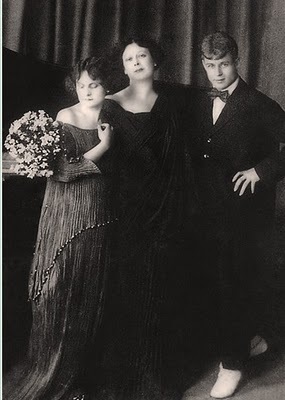 Before long though avant garde women such as Isadora Duncan began wearing them outside the house and they became a popular item for more daring ladies. 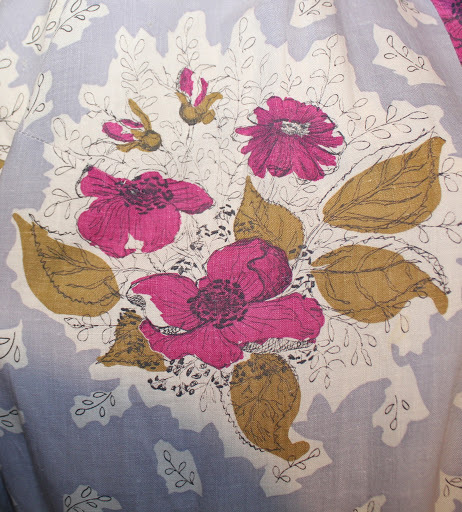 He is also well known for his velvet creations which were hand painted ans stencilled in his studio. Many of these pieces often take inspiration from medieval designs and have something of an ecclesiastical robes looks to them. 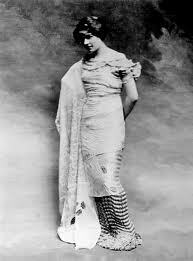 He was also famed for his knossos scarf which was one of his first fashion creations. Model with a Knossos scarf over a Delphos gown, 1909. 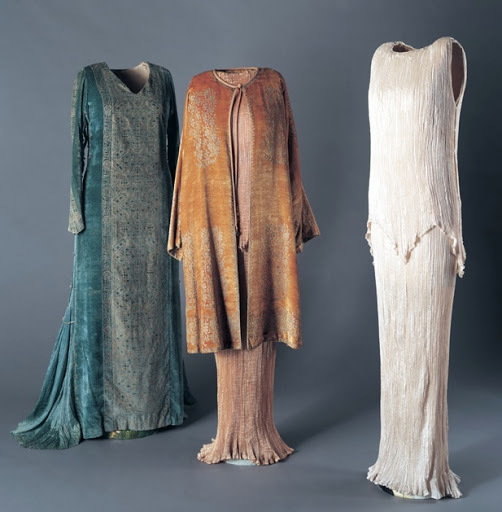 Fortuny’s dresses allow the female form to speak to itself. Due to the springy pleats the dresses cling to the body, in a way that that when they were first introduced probably seemed indecent. 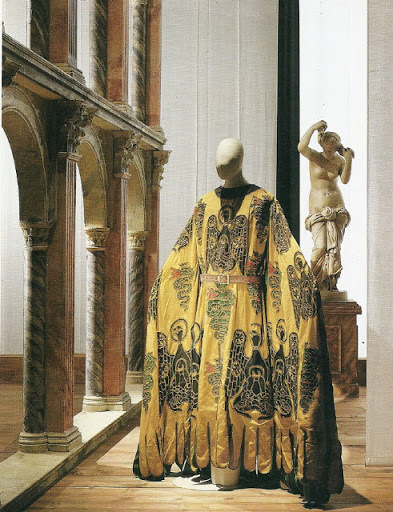 Whilst Fortuny’s designs derived from antiquity he is often aligned with the rational/ artistic dress reformers whose ideas fitted with the style of his garments. 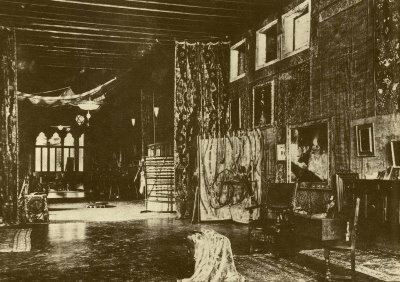 All of Fortuny’s designs were created at his house Palazzo Orfei in Venice. Despite being a Spanish designer Fortuny is often more closely aligned with this city where he spent his working life. The palazzo was a hub of creativity, as the images inside it testify. Here Fortuny worked alongside his wife Henriette who often assisted design and made up most of the dresses. Everything, bar the tiny venetian glass beads that were sewn onto the delphos dresses to weight them was made in their studio. 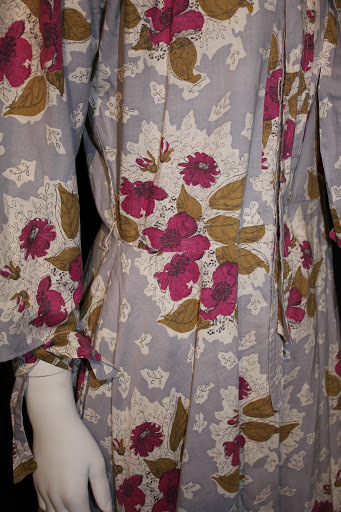 Fortuny’s dresses have something of a timeless appeal to them. Whatever period they have been worn in they still appear fresh and modern. Natalie Vodianova has (or rather had) two of these dresses, and still they look effortlessly elegant. 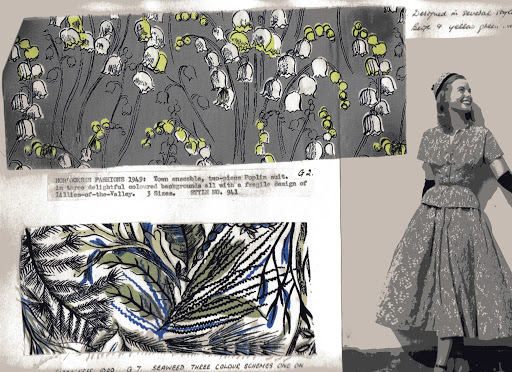 Here are a few of my favourite images of Fortuny dresses, I’ve tried to pick them from a wide ranging timescale to give an idea of the wearability of the dresses. 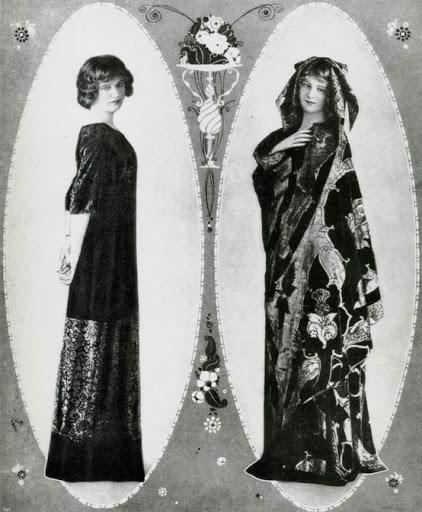 Undated image of two Fortuny dresses- these show his skills in silk velvet. I think (due to hairstyles) these images are quite early. 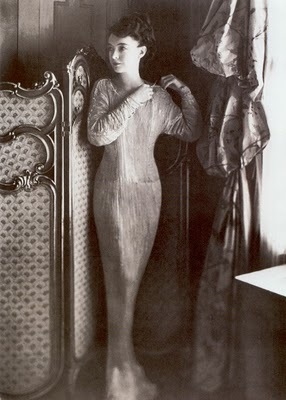 Countess Elsie Lee Gozzi wearing an Eleanora dress, 1920s. 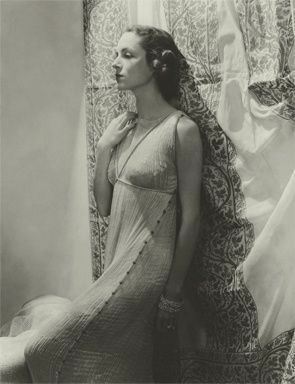 Mai-Mai Sze in a Fortuny gown, 1934. 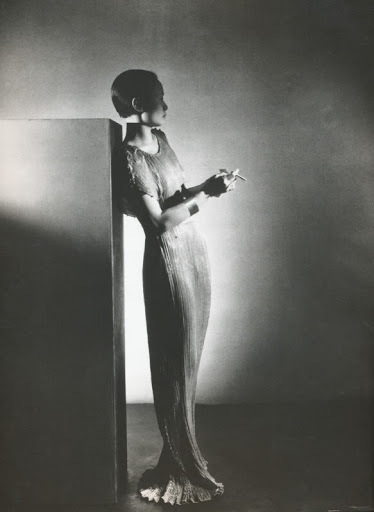 Photograph by George Platt Lynes . 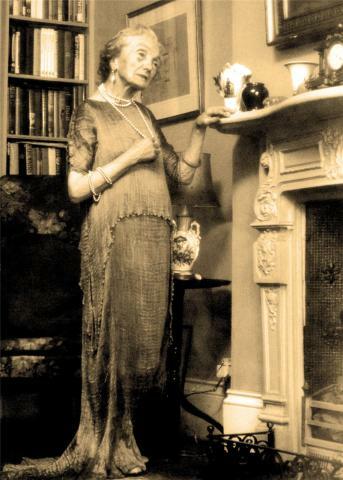 Elderly lady wearing a Fortuny dress. Undated but probably 1920s. 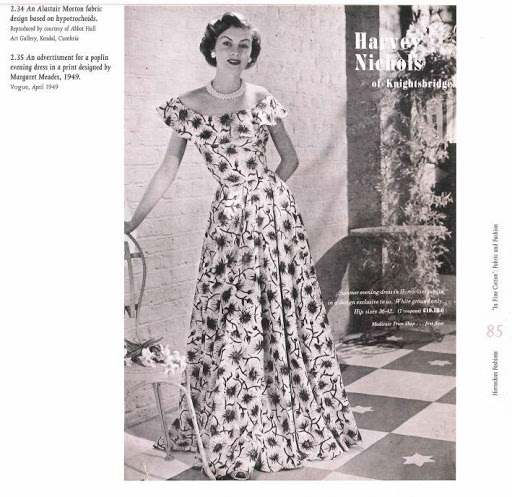 Due to the fact that the dresses were designed to be kept twisted up in skeins they were the ultimate travel dresses. When they were first sold it must have been a liberating experience for a woman to have a dress that would travel so easily, and also require little care in respect of pressing. 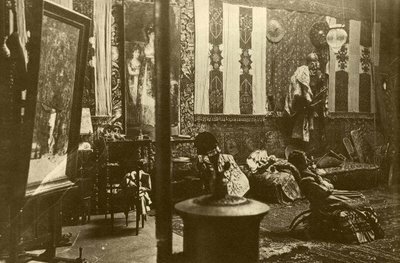 As can be seen from these images Fortuny was perhaps more artist rather than designer. He was creating wearable art rather than fashion, and had no desire to be part of the fashion system and only gently tweaked his designs over the 40 years he was creating them. 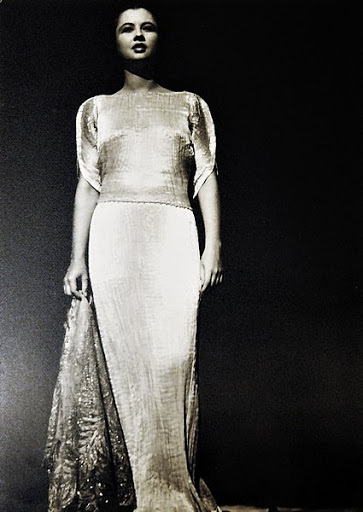 Fortuny dresses still command incredibly high prices, partly because Fortuny took the secret of his pleating process to the grave and it has never quite been replicated.